The city scape line against the passionate red RE/MAX background. We utilized the latest logo to follow proper guidelines. On the back you may place a photo of yourself or leave it blank, it’s up to you. Customizing is easy and fast. 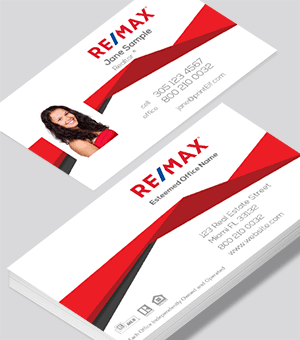 The business card for the passionate Realtor. 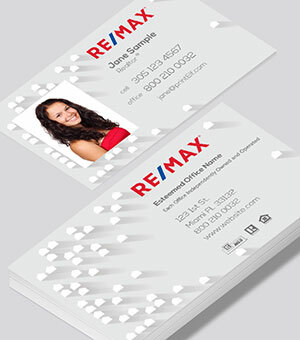 This clean RE/MAX business card is dotted with small houses. The back and front is nicely divided to show pertinent information. Naturally you can change it all around and adjust to your needs. Upload your photo or leave blank. This is a classic well proven design. 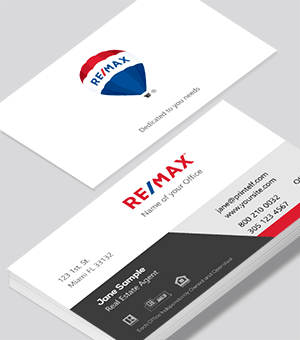 We made sure the latest RE/MAX logo was used. Utilize the back of the card to insert your photo or omit it. Write a catchy phrase to match your personality. Stylized roof lines create a wonderful contrast and division. This business card is very modern and striking. Your passion is realty. Why not show it with a card to match it? Use our super-fast online designer create the design you always wanted. Use our online printing services for all your marketing material. The RE/MAX balloon is unmistakable. We made sure the latest version was used in this design. It’s very classic and beautiful with striking colors. 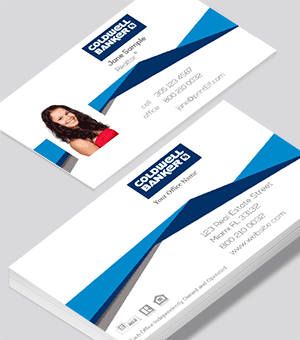 As all our designs, you can customize any and all elements in the business card. As a real estate agent stay up to date with the latest design. This design clearly divides pertinent information. Your name against a dark background combined with opposing information. 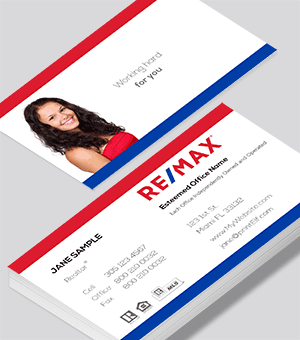 Naturally you can customize this business card design to your heart’s desire. Let us know if you get stuck or if you need us to design for you. We are constantly adding new designs. Please give us some time to expand on the Coldwell Banker collection. The city scape line against the deep blue Coldwell Banker background. We used the latest logo to follow proper guidelines. Use the back to upload a photo of yourself or leave it blank, it’s up to you. Customizing is easy and fast. 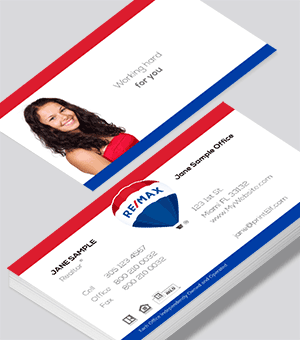 The business card for the dynamic Realtor. Stylized roof lines create a wonderful contrast and division. This business card is very modern and works well with today’s demanding clients. Your passion is realty. Why not show it with a card to match it? Use our ultra-fast online designer and create your own look. 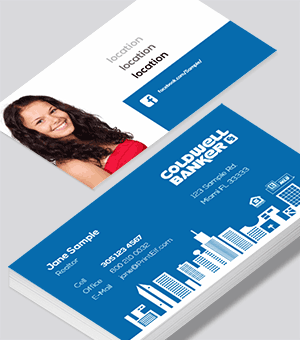 Use our online printing services for all your marketing material. 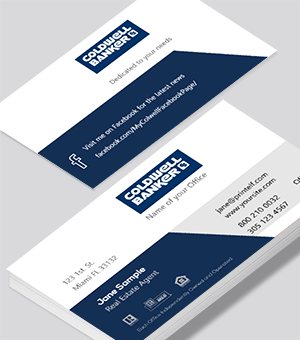 Your name against the Coldwell Banker dark blue. 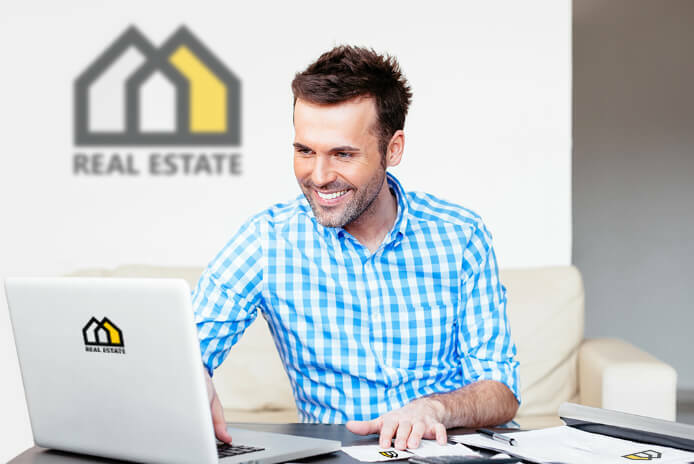 As a real estate agent you might have a web presence in form of social media, blog or site. Why not use the back of your card to remind people with an appropriate link. As always, customize to your needs or contact us for custom work. 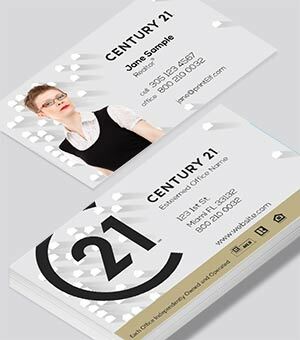 We are working on new Century 21 business card designs. Please check back soon. This clean Century 21 business card is dotted with small houses. The back and front is nicely divided to show pertinent information. Naturally you can change it all around and adjust to your needs. Upload your photo or leave blank. If you like clean and modern then this is the business card for you. 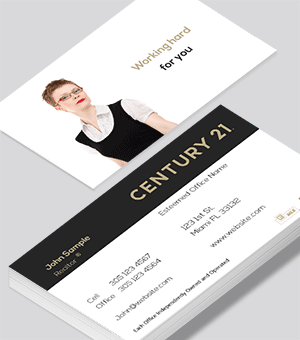 Century 21 utilizes golden yellow with striking black. 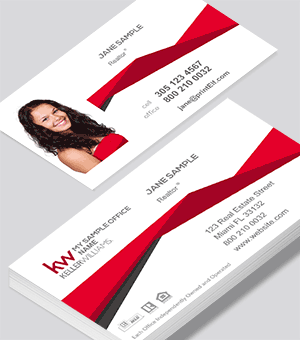 We are working on new Keller Williams business card designs. Please check back soon. This abstract roof lines divide pertinent information. Naturally you can change it all around and adjust to your needs. Upload your photo or leave blank. Pick one of our templates from our expanding selection. Once at the Online Designer you can make simple quick changes or modify to your hearts desire.